Very local in southern Greece becoming rare in northern Greece. 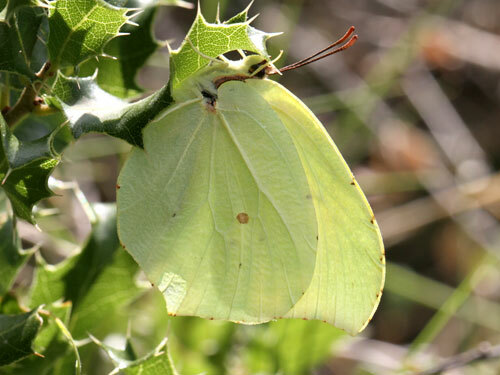 Difficult to separate from the much more common and widespread brimstone, G. rhamni, with which it flies. 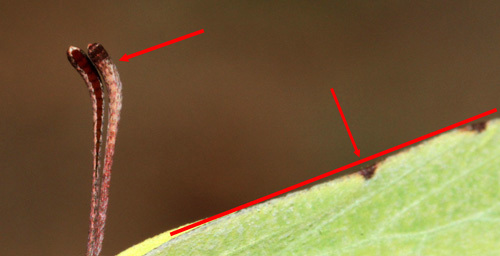 Wing shape of hindwing inner margin: relatively smooth vs two deep scalops. Wing shape forewing apical hook: strong hook vs weak hook. 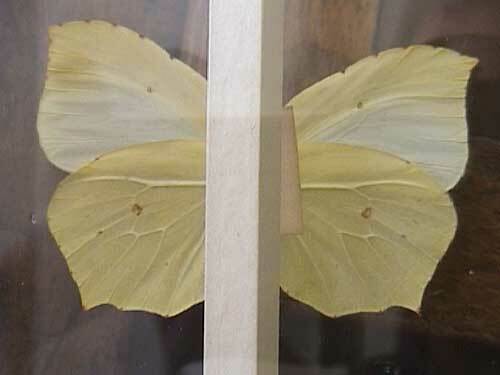 Wing shape forewing costa: straight vs gently convex curve. Male basal area of forewings: smooth vs rough, covered in powdery andriconal scales. Male upperside colouration: both wings the same vs paler and greenish forewing (while visible in flight it was a subtle effect and, for me, not sufficient to be sure of identification). Antennal clubs: black vs pink. Distribution & Flight: Only Greece, FYROM and south Bulgaria. Rare and very local in the north, more frequently found in south Greece, although still very local here and hard to find. As for the brimstone,G. 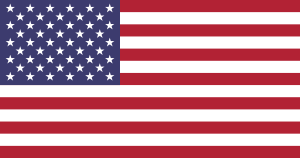 rhamni, it is single brooded, emerging in June/ July before hibernating and remerging in early spring in March/ April. Habitat & Behaviour: Bushy places with flowers in dry hills from low levels to 1500m. 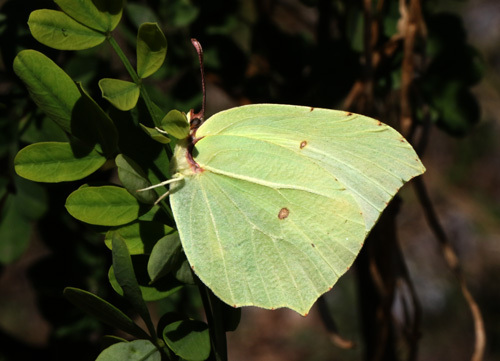 Variation: Wing shape and colouration are variable which can make these features difficult to use to separate similar species. 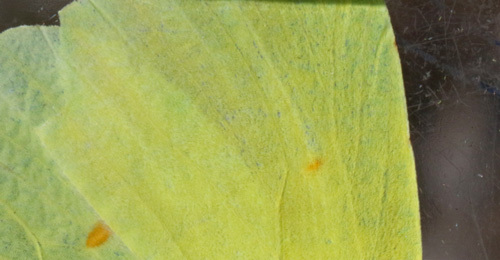 Leading edge of forewing not concave in both G. farinosa nor G. cloepatra. Antennal clubs with white (I'm not 100% convinced about this feature - I find it difficult to use). 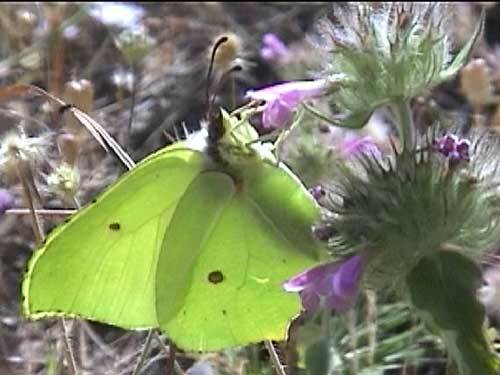 Leading edge of forewing is clearly concave in the brimstone G. rhamni. Antennal club is not white. 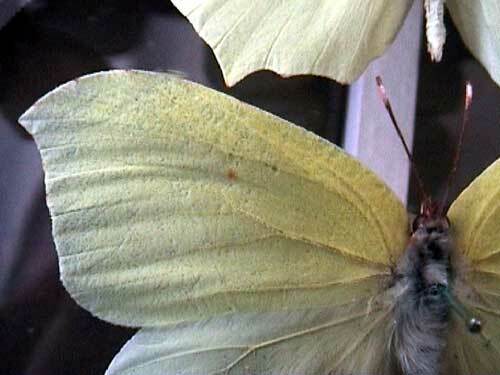 Rough scaling on upperside forewing. Roughened forewing and antennal clubs pink with a white patch. 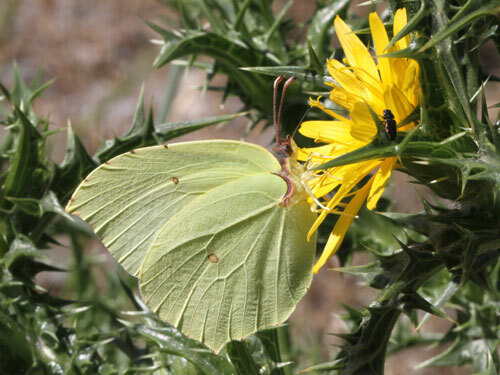 Yellower forewing, greener hindwing may be visible here. Reduced hindwing hook and deeper scallops of inner margin. 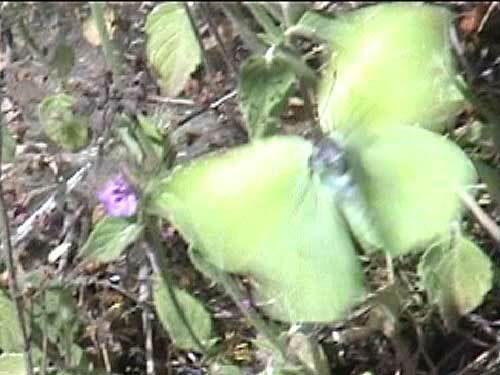 A correspondent has correctly identified this as G. rhamni, not farinosa. Note the concave costa - this should be straight or convex in farinosa.